As a 85th birthday tribute to their divine Chancellor, His university students from the Anantapur Campus presented a special series ‘Women of Glory’ on Radio Sai in the fall of 2010. Every week, they highlighted a distinguished woman of the world. Among them was Dr. Wangari Muta Maathai, the first African woman to win a Nobel Peace Prize, who died on September 25, 2011. A biologist by training, she founded the Greenbelt Movement and made visible the links between trees and soil, war and peace, and the human body and spirit. An unparalleled environmentalist, an untiring activist for women’s rights, a crusader of trees for 45 years, a pioneering academic, a voice of hope and courage to everyone in Africa, a critic against deforestation, the UN’s messenger of peace – all of these are but a few of the epithets that can be ascribed to Dr. Maathai. In memory of her exemplary life and in appreciation of her contribution to our planet, we present this special feature on her and replay the Sri Sathya Sai Institute of Higher Learning, Anantapur team's programme on this Woman of Glory. This edition of 'Women of Glory', is a panel discussion between four environmental science experts – Ms. Nandini (N), Ms. Lalitha (L), Ms. Shweta (Sh) and Ms. Sushma (Su), and it is lead by moderator Ms. Parvathy (P). P: Lalitha, could you please tell us what gave Dr. Wangari Maathai the drive to pursue her vocation? It is undoubtedly true that man has forgotten the importance of nature and the nurturing of human life by Mother Earth. Our exploitation of natural resources has surpassed its limits. We enjoy materialistic comforts through devastating our surroundings. Bhagavan Sri Sathya Sai Baba has also emphasized on man’s misconduct towards nature. In the novel, Life of Pi, the author Yann Martel mentions a zoo that has a note saying, ‘The deadliest animal’. This note is placed above a mirror. Truly, we human beings are proving to be the planet’s most dangerous animals, devastating the very environment that sustains and nurtures us. However despite our recklessness with which we plunder our resources to satiate our greed, it is the strong voices of people such as Prof. Maathai that force the world to stop and take notice. P: You are right, Shweta. Kenyan environmentalist, activist and global champion of peace, Wangari Maathai is a pioneer who made the world sit up and take stock of its destructive traits. Born on April 1, 1940 at Nyeri in Kenya, she was the first woman in East and Central Africa to earn a doctorate degree in biological science. She was also the first woman to introduce the idea of community-based tree planting during the mid-1970s. Her inspiration partly came from her childhood experiences and observations of nature in rural Kenya. During her childhood years, she witnessed the forest being cleared and replaced by commercial plantations. Her awareness was also influenced and shaped by the formal education she was privileged to receive in Kenya, the US and Germany. P: Did she have a concrete action plan, Sushma? Su: Her strategy was to safeguard and strengthen the foundations of sustainable development. For this, she adopted a holistic approach that embraced democracy, human rights and women’s rights in particular. Her singular goal was to protect God’s work and make the Earth the Garden of Eden that God created. P: That was definitely unique…but how did she go about it? 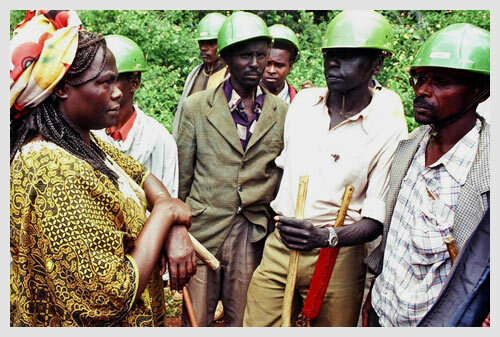 Wangari confronted by askaris (local armed guards) at Karura Forest. Sh: She thought globally and acted locally. In her own country, she urged the public not to use plastic bags that could not be recycled, as these bags clogged waste dumps and blighted the landscape in Kenya and other countries, besides serving as breeding grounds for mosquitoes. She also insisted on the 4R’s – Reduce, Reuse, Recycle and Repair. L: And what began as a simple idea later blossomed into a world movement. 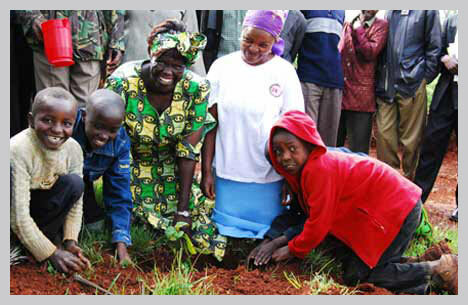 Prof. Maathai’s internationally recognized program - the Green Belt Movement - focused primarily on environmental conservation through tree planting, and in the process created employment opportunities for the poor. The movement drew the participation of several leaders of other African countries too. N: Dr. Wangari Maathai’s initiatives included protecting the Congo basin rainforest ecosystem. She was the roving ambassador for the Congo basin which is a global hotspot for biodiversity and one of the world’s two remaining forest “lungs”. The rainforests in Central Africa play an important role in absorbing carbon dioxide and providing the world with oxygen. Yet, the Congo basin forest ecosystem is threatened by illegal logging, mineral exploration, poaching and bushmeat trade; all of which placed the trees, the animals and the people who depend on them at risk. In building up her crusade to protect the forests, Prof. Maathai learnt of a government plan to privatise large areas of land in the Karura forest. She protested against this plan through letters to the government and the press. In addition, she went with the members of the Green Belt Movement to the forest, planting trees to fight against the destruction of these forests. P: Prof. Maathai’s life itself was flowing wave of values that are worthy of adopting. She has said, “We cannot develop our countries if we are going to continue corruption on both sides. We must trust them .We do need transparency, accountability, honesty, and a sense of responsibility.” She had remarkable tolerance, patience, and perseverance for she took huge personal risks to fight for justice, as well as human and environmental rights. She considered problems to be purposeful road blocks that offer beneficial lessons and enhance mental strength. She also believed in human partnership and the happiness found in togetherness. L: Another cause close to her heart was the upliftment of poor rural women. Prof. Wangari Maathai believed in the immense feminine strength and worked hard to mobilize poor women for the Green Belt Movement. 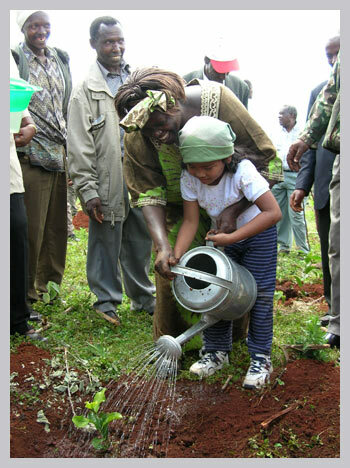 Dr. Maathai encouraged women to plant trees. During her lifetime, over 30 million trees were planted. This activity created employment, through which women gained a degree of importance in their family, especially on the social and economic fronts. She always wished to pay a special tribute and express special support for the woman in the world. P: What was the secret of her interminable inspiration? N: Prof. Maathai portrayed love in every action of hers. Love was her very breath that tied the knot of natural attachment with the green progeny of the Lord. Every struggle she underwent highlights the pure, unconditional and unsullied love that formed the basis of her selfless deeds. Her life and work epitomizes the phrase “Love is selflessness and the self is lovelessness’. She also received the Jawaharlal Nehru award at a special function at Rashtrapati Bhavan in New Delhi. The award was given to her on 22 March 2007 for her outstanding contribution to the promotion of international understanding, goodwill and friendship. Su: With indomitable spirit, she strived to make her dream a reality, probably because of the deep impact of her childhood days. She has often narrated her childhood experience about visiting a stream next to her house to fetch water for her mother. She would drink the water straight from the stream. Playing among the arrowroot leaves, she would spend hours trying to pick the strands of frog eggs believing them to be beads, but every time she puts her little fingers under them, they would break. clarion call - "Let us plant for the planet"
L: One day, she saw thousands of tadpoles: black, energetic and wriggling through the muddy water against the background of the brown earth. That was the world she inherited from her parents. Today, over 50 years later, that same stream has dried up, women walk long distances for water that is always not clean and children will never know what they have lost. P: The challenge is to restore the home of tadpoles and give back to our children a world of beauty and wonder. One of the hallmarks of visionary leadership lies in the translation of positive intentions into tangible results. 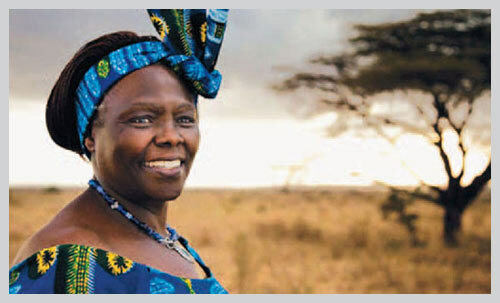 Dr. Wangari Muta Maathai has been one of the most powerful motivators in the world who helped draw out people’s potential for a compelling cause – ‘Saving the Mother Earth’. To conclude, the purpose of life is not only to be happy but also to be useful, to be responsible, to be compassionate and above all to matter, to count, to stand for something, to have made some difference. 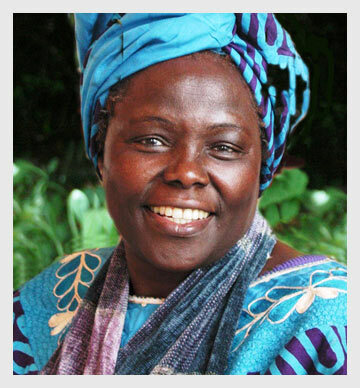 Dr. Wangari Muta Maathai is a true achiever whose lifetime crusade to bring about change changed the lives of many. Her fearless strength in adversity, her creative approach to building a peaceful, healthy planet and her hard work to empower women will continue to inspire several future generations. Simply said, her work lives on.